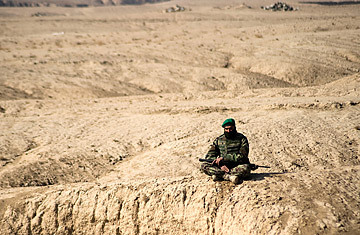 An Afghan National Army soldier takes a break during training at the Kabul Military Training Center, Sunday, Jan. 30, 2011, in Kabul. The expansion of Afghanistan's government forces, both military and police, has been a much-touted goal of both Washington and Kabul. It is the key program in the run-up to the gradual U.S. handover of security responsibilites to the Karzai regime scheduled to begin in July. The goal of 305,000-member Afghan National Security Force (ANSF) by October 2011, however, has to overcome a huge obstacle. Even though the U.S. claims that 79,000 men have joined the police and army since December 2009, swelling its numbers to 270,000, the Afghan army loses 32% and the police lose 23% of their personnel to attrition each year. According to U.S. Lieut. Gen. William Caldwell, commander of NATO's training mission in Afghanistan. though 110,000 men had been recruited in 2010, the high attrition rates meant that the total increase in manpower was only 70,000. At that rate, said one media calculation, NATO will need to recruit and train 86,000 men in order to add just 35,000. The high attrition rate is not the only problem. "We can build a soldier, train, develop and equip a soldier fairly rapidly, .... but to produce a leader takes longer," Caldwell said at a press conference last week, touching on the lack of non-commissioned officers in the security forces. Along with low pay, poor living conditions and shoddy equipment, poor leadership leads to more soldiers going AWOL as well as to higher casualty rates. Caldwell said that 98% of those going AWOL are from field units, especially those in areas of intense fighting. From January 2007 to November 2010, 3,595 police and soldiers were killed in action and 7,339 were wounded, according to a report by the Congressional Research Service. Also, a wave of suicide bombings across the country have targeted police and soldiers. Understandably, there is a lot of fear. "My father said he did not want me to die," says Zemarai Marai, a 20-year-old taxi driver in Kabul, after completing only a portion of his police training. "He would not allow me to finish. He told me that if I continue to train for the police, I should not come home. He said I would not be his son. So I went home." Police are "fleeing their battalions because they don't have any idea of what the future is," says an Afghan National Police field commander, speaking on condition of anonymity because he did not have permission to talk to TIME. He says that, with no advance warning, soldiers from the north are sent south to violent provinces like Helmand and Kandahar where northerners are viewed with suspicion. "They see that it is very dangerous and they escape," he says. At the same time that there is an effort to tout increasing recruitment numbers, there was talk last week in Washington about capping spending on security. "The international community and Afghanistan cannot afford a force of 375,000 ANSF indefinitely," said Defense Secretary Robert Gates at a Senate Armed Services Committee hearing on Feb. 17, referring to a proposed plan by the Afghan government to expand the final number of security forces by a quarter. "We have to think of this, I think, more as a surge for the Afghans. And with the political settlement and with the degrading of the Taliban, perhaps the size of the ANSF can come down to a point where it's more affordable for us." Congress has budgeted $12.8 billion to support the ANSF for 2012. "We can't sustain that for many years. And so a lot depends on being successful by 2014 in  in getting the transition to the Afghans," Gates said. Afghan Defense Minister Abdul Rahim Wardak , who was in the US last week, said the Afghanization of security would be "cost effective." The recent fielding of the controversial Afghan Local Police (ALP) force could be seen as a way for both sides to get what they want. The force, which critics fear will simply legitimatize existing militias, is stabilization on the cheap. "A shield of meat" was how an interior ministry official characterized the ALP to Human Rights Watch's Afghanistan analyst Rachel Reid, because they only get three weeks of training, a small salary and shoddy equipment. Also, the ALP will serve in places where there is little coalition or ANSF presence, NATO said on its website. These are "some of the most dangerous places in the country," said Reid. "This is high speed security. You can't rush it," she said. The Taliban has already taken notice. In a possible sign of the carnage to come, a suicide bomber last week tried to get into a meeting of local ALP militia commanders in Kunduz, a formerly peaceful northern province. When he couldn't get in, the bomber blew himself up outside, killing 30 civilians and wounding 40. In the end, the move may be counter-productive. Although the government will be able to field a bigger force and the U.S. can claim higher numbers, the ALP militias' lack of training will lead to higher casualty rates. This could cause increased attrition among the security forces as more fear spreads  as well as making it harder for the U.S. and the Afghan government to claim that the security forces are ready for the start of the handover in July  an essential step in the 2014 exit strategy. Read "The Afghan National Army in Combat: Dazed and Confused?" See pictures of Afghanistan's dangerous Korengal Valley.